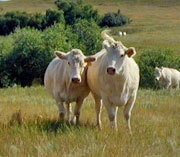 Welcome to the home page of Bock Charolais Ranch. 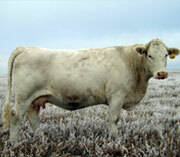 Bock Charolais Ranch is a registered Charolais operation located on the eastern edge of the North Dakota Badlands. This web site was designed to provide information to our existing clients as well as to those who are looking for top quality Charolais genetics. The goal of Bock Charolais Ranch is to produce predictable, consistent genetics, which perform on the range, in the feedlot, and on the rail. We select for traits that will optimize the profitability of the commercial cattleman. We strive for longevity, soundness, calving ease, and performance. Just as in your operation, our bottom line dictates that our cows must calve unassisted and breed back on schedule with minimal inputs. With our history of strong culling, we believe that if we can make these cattle work in the rugged ND badlands, we can make them work anywhere. Only breed leading sires are utilized as we have narrowed our genetic focus through a rigorous Artificial Insemination and Embryo Transfer program. We don’t jump on the latest bandwagon. Our goal is simply to provide the best quality bulls that will add dollars to your bottom line. We have fed out hundreds of progeny from our bulls, and know they are very efficient and will make a profit for the feeder. As feed costs go up, feed efficiency becomes that much more important. As a service to our customers, we can refer you to cattle feeders who are interested in buying calves with Bock Charolais breeding. Many recognize the premium placed on high growth calves that will gain and grade. Whether you need one animal or a dozen, we can personally help you fit the appropriate genetics to your needs. 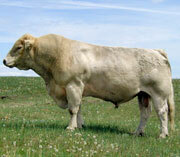 Call or e-mail us today to see how Bock Charolais Ranch genetics will add profit to your bottom line.